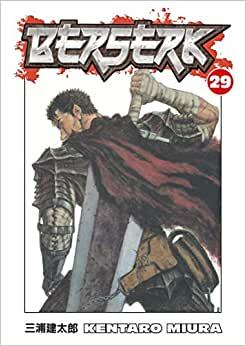 Start reading Berserk Volume 29 on your Kindle in under a minute. 5.0 out of 5 starsA character driven portion, but still amazing! Angry at Isidro damaging her witch's cap, Schreike as run away from the party. The young witch has encountered Siona, the medium for the Band of the Hawk. Not realizing the young girl serves Griffith who is responsible for her teacher's death, Schreike finds a friend to bond with. But things get dangerous when the two girls are unable to stand by while a group of slavers carry off children. But even her magic has its limits. Isidro and Lord Mule, Siona's young protector, will have to step in to help. It's a chance for Isidro to make up for his careless action and to prove his training. But he's fighting humans, not monsters. Will he have the stomach for killing? While the children play, Farness goes to her family to secure a vessel. Can she stand up to her father, or will she find herself thrust back into her role as noble daughter, abandoning her training as a mage and helping Guts protect Casca. And over it all lurks the impending attack of the Kushan forces. Volume 29 is a time for the supporting characters to develop. Guts spends most of his time resting, still recovering from his fight a month ago at the witch's house and their battle with the Kushan monsters the day before. The berserker armor has taken such a toll on him, he has a vulnerability about himself that he's lacked before. Lying abed, listening to the others talk. He has to become even more of a leader than the man recklessly charging into battle. But that iron will to fight still lurks in him. As he proved last volume, if a fight comes, he will be ready to face it. But, for now, Schreike and Siona get to bond, Isidro gets to learn more about himself, and Farness has to face her past and see if she can break free of her overbearing father's shadow. Reading this volumes when they were coming out a year or more apart was frustrating, but when you get to read them back to back, the story flows in such a continuous fashion that is quite the treat to read. BERSERK, even when it's focused on characters and has almost none of the violence that characterized the story, is still fun to read. Fans of fantasy need to read BERSERK!